The competition was judged by a team of three judges: Dr Adeline Johns-Putra (Reader in English at the University of Surrey and Chair of ASLE-UKI), Dr Matthew Jarvis (Anthony Dyson Fellow in Poetry at the University of Wales Trinity Saint David), and Dr Paul Wright (Head of the School of Cultural Studies also at University of Wales Trinity Saint David). 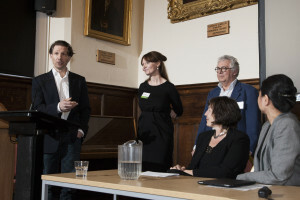 The winning essay, selected unanimously by the judges, was a collaborative entry entitled: ‘Reading with the Grain: Sustainability and the Literary Imagination’, by three scholars from Aberystwyth University: Dr Jayne Elisabeth Archer, Professor Richard Marggraf Turley and Professor Howard Thomas. Their essay, which seeks to read Shakespeare’s King Lear ‘with the grain’, ‘…attempts to reconnect [Shakespeare’s] plays with the crisis of food supply, distribution and sustenance in the England of Shakespeare’s own day – a crisis in which, through his business dealings, the playwright was himself a player’ (Richard Marggraf Turley). According to Adeline Johns-Putra, the essay was, ‘…a clear winner; excellent, nuanced analysis, rigorously historicised yet compelling throughout and with wide appeal’. Since the announcement of the winning essay at the ASLE-UKI symposium in March, the essay has gone on to receive notable national and global press interest (also see Turley’s blog). This project has been an interesting development, which, alongside the symposium, originated not just from a conversation over coffee about how to teach Research Methods to English Literature students through the lens of “sustainability,” but from INSPIRE’s initiation of the inclusion of “sustainability” at curricula level at Lampeter in the first place. Led by former Welsh Minister for Environment and Sustainability, Jane Davidson, INSPIRE is also a recent winner of the Guardian University Awards. The aim of the symposium and competition has been to provide a platform for literary scholarship to engage with the question of sustainability; via the Hay Festival platform, this project also provides a valuable impact opportunity. If you’d like to attend the delivery of the winning lecture at Hay, it is scheduled for 7.00pm on Thursday 23rd May, which is also Hay on Earth Day. The lecture will be followed by dialogue between the winners, director of INSPIRE Jane Davidson, and Dr Adeline Johns-Putra of the University of Surrey. The Hay Festival of Literature and the Arts is a notable event on the literary calendar and well worth a day out. Tickets for the event cost £3.00, and entrance to Hay and to the event is free for students. Further information about the announcement of the winners at the ASLE-UKI symposium is available here.